Half Moon Bay Resort offers a relaxed tranquil setting to enjoy the sounds of the birds, a stroll through our lush tropical gardens or a lounge by the resort pool The Resort overlooks Half Moon Bay Golf Club and is bordered by a nature reserve. 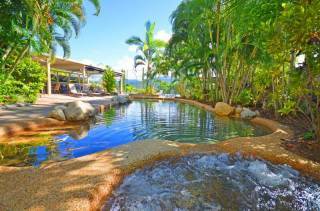 Situated at Yorkeys Knob on the northern beaches of Cairns. 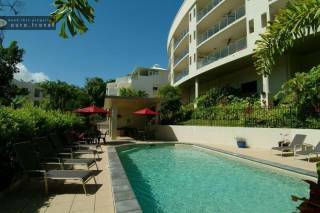 It is centrally located to all the tourists attractions, only 15 minutes to the airport, 20 minutes to Cairns City, 10 minutes to James Cook Univisity, and 50 minutes to Port Douglas. The Resort is walking distance to the local shopping area, with a supermarket, post office, liquor store, cafe and restaurants. Yorkeys Knob beach and the famous boat marina is a short stroll away. Each unit features a lounge, fully equipped kitchen with microwave, full landndry facilities, air conditioning, private balcony,free Foxtel, free Wifi, salt water swimming pool and spa,under-cover car parking and tour desk at Reception. We have 12 fully self contained one bedroom apartments which are set in lush tropical gardens opposite the picturesque Half Moon Bay Golf Course. Our complex has a freeform salt water pool with spa pool attached and BBQ area for your enjoyment. All of our apartments are one bedroom with queen size bed in the master bedroom with ensuite bathroom and double sofa bed in the lounge. They sleep a maximum of 4 people. Each apartment has kitchen and laundry facilities, ceiling fans, colour television, STD direct dial telephone, air-conditioning and a private balcony. 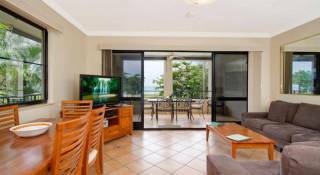 Half Moon Bay Resort is within easy walking distance of local restaurants, the Half Moon Bay Yacht Club and marina, and the Yorkeys Knob shopping centre. Half Moon Bay Golf Club is located directly opposite the Resort, offering light luncheon snacks. Check In 2.00pm Check Out 10.00am Please supply your time of arrival and email address / contact details on the booking form so we can contact you and if you are arriving after hours, arrange for keys, etc, to be left for you. For bookings with a minimum of seven nights, we offer complimentary one way airport transfer between the hours 7.30am and 6.30pm Monday to Friday - must be pre-booked. Please contact us once you have made your booking. From Cairns Airport, Coral Coaches are available for transfers, or Black & White Taxis cost approximately $46.00 to Yorkeys Knob. If you are driving, proceed north on Captain Cook Highway to Yorkeys Knob roundabout (approximately 11km from the airport), turn right and drive into Yorkeys Knob. Turn left at Wattle Street and proceed approxiamtely 500 metres to Half Moon Bay Resort on the left. We also have a full tour desk, so there is no need to prebook your tours as we have over 250 brochures at reception that we can go through with you and give you good advice.